Mattias Ekholm, whose penalty late in regulation put Nashville in harm’s way, roared out of the penalty box to net the game winner with 2:27 left in overtime as the visiting Predators rallied for a 5-4 win over the Dallas Stars on Saturday afternoon. Nashville won its fifth straight game and remains perfect on the road this year. Its 8-0 start away from home is the third-best streak in league history. Ekholm’s goal came with assists by Kyle Turris and P.K. Subban as both teams were playing four-on-four in the extra period. Tyler Pitlick got the Stars on the board when he snapped a wrist shot through traffic that beat Nashville goaltender Juuse Saros to the glove side with 6:55 to play in the first period. Radek Faksa got the assist on the tally for the Stars. The Predators tied the score just 12 seconds into the second period as Ryan Hartman picked the pocket of Dallas defender Julius Honka and skated in alone on Stars netminder Ben Bishop, ripping off a wicked wrister than bounced off the inside of Bishop’s left leg and into the net. Honka made up for his gaffe by setting the table for Tyler Seguin’s tiebreaking goal at the 6:47 mark of the second period, sending the puck across the crease to Seguin’s waiting stick as he beat Saros above his blocker. 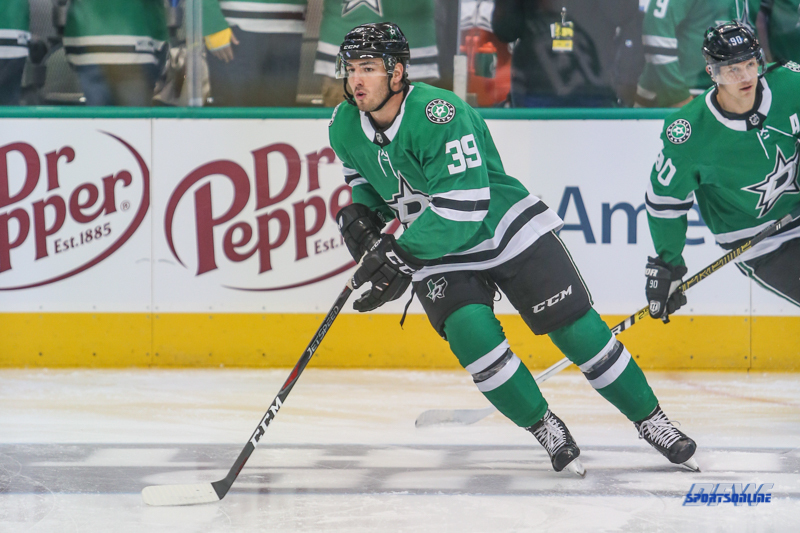 Dallas added to the lead with a power-play goal by Jason Spezza with 5:28 to play in the second period. Spezza, working in the circle, hammered the loose puck past Saros. Nashville came out flying in the third period, scoring twice in the first 1:54 to tie the score. First, just 17 seconds into the period, Ryan Johansen rolled to the net and tipped in the deflection of a shot by Roman Josi after a pass by Viktor Arvidsson. Then Yannick Weber uncorked a wicked, tumbling shot from the right point that eluded Bishop, who was partially screened on the play, and tied the score at 3-3. Kevin Fiala and Anthony Bitetto earned assists on the play. Denis Gurianov scored his first NHL goal in just his third league game to give the Stars a 4-3 lead at the 8:58 mark of the third. Ben Gleason’s shot from the right point deflected off Gurianov’s right knee and into the net. Jamie Benn also got an assist. Nashville tied the score again with a power-play goal by Josi with 42.5 seconds remaining in regulation, assisted by Johansen and Filip Forsberg.